Because of her, poor filipinos are getting worse in number. - PNOY got the presidency! Because of her, many undistinguished individuals were brought into the limelight. Margie Juico and Rpsario Uriarte became instant celebrity moms. Bishop Pueblo bring out his popularity - now a candidate for the Philippine next top cardinal. Because of her, controversial personalities in the land are getting grim. Zaldy Ampatuan acquired heart ailments and certain complications because of state witness rejection. Jokjok Bolante suffered poor health and was contained in the hospital because of severe conscienceless syndrome. Celso delos Angelos lost his legacy and even his family and life legacy. And even her comrade in business and politics gave out his life + may he rest in peace. Because of her, FPJ died and lost his presidency and Loren didn't gain the vice presidential seat, did she? Willie Revillame lost his job with wowowee(the defunct show) - how was it related? Prospero Pichay got his prize - tax evasion! Lintang Bedol showed up, he's getting no more money. Merciditas Guttierez resigned as ombudsman, because she got no more gloria. Because of her, good animals gone bad! Crocodiles and alligators are getting bigger and bigger. Typhoons and floods are frequently coming in. Philippines is getting worst. Disasters, killings, abductions and all atrocities are becoming more rampant! - It's all her business. 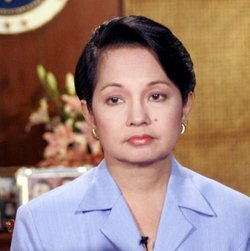 She is definitely the main reason why Philippines remained a third-world country. And finally, because of her PNOY's SONA is leading to State Of No Accomplishment. Leadership always drive on the positive end, adversing difficulties and struggling to what is even.